To cut the pocket I used the DRO’s angled line function (the faces I cut by eye), tedious but probably faster, overall, than dialing in two angled setups. If I was going to make more of these, I’d probably make a jig. I tried using a machinist vise but that was a bust. 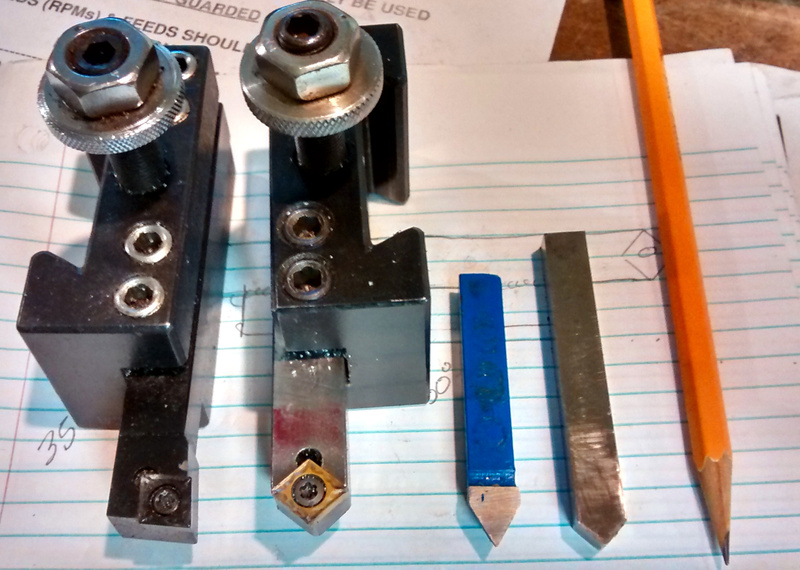 My collection of champfer tools, past and present: From right to left: draw and file, a HSS hand ground bit that works well but material builds up really fast so it needs to be honed often, a brazed on threading bit that works OK but the angle is usually not-quite-right and the el-cheapo bits I have are made with Velveeta carbide, finally, the newest edition, made to use the used up bits of the left most tool, both using CCMT 32.5x inserts. I swear, there are more options for inserts than there are shoes, so I get my Carmex screwtools from Lathe Inserts; they work, the prices are good and they don’t have an overwhelming selection. But they don’t have a champfer lathe tool and when I asked about using the two unused edges of a CCMT insert, they told me the geometry was wrong. But everything else I found was quite expensive and I’d have to start a new insert collection and I can’t just throw away bits with brand new cutting edges (even though the usable edgCarmex screwes are used up). So, I’ve been sitting on it, hence the variety of tools in the photo. Plus, trying to find info on the insert and screws really taxed my ability to use google. The first C (in CCMT) means 80° diamond, the 3 means 3*1/8″ inscribed circle but what is the hole size? The screw seat is also a strange one. I bought several screws from Enco and the Seco M3.5x.6 is what I wanted (a milling cutter, not lathe, screw $5 a pop, ouch. There is also a $1 Carmex screw that will work but it is smaller. Be warned that different 3/8″ IC inserts have different sized screw holes). Knowing that the interior angles of a quadrilateral add up to 360° means the angle I’m interested in is 50° (2*80 + 2*50 = 360). Should be simple to mill a pocket in a piece of metal to do a test, shouldn’t it? As with a lot of things, set up is a lot harder than actually doing it. I had a really hard time trying to figure 0ut how to hold the blank for milling. I really wanted to use the rotary table; I tried clamping directly to the table, clamping to a 123 block and clamping the block to the table but what ever I did, I either couldn’t get it secure or there were too many clamps to be able to indicate the blank¹. So, I used this dicey setup with a sine bar. This required two setups, which meant I had to re-indicate X,Y & Z for each edge (using the 3/16″ hole I punched in the center), something I hate to do but it worked out. 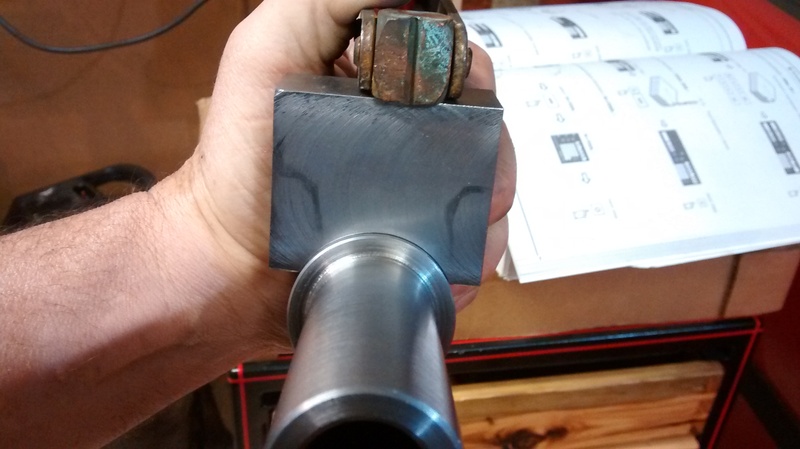 To keep the frustration to a minimum, I figured out how I could hold the part in the morning and did the machining that evening, hoping I’d think of something in between. And testing indicates it works great. Although I really want to figure out how to cut this with a single set up. Without buying a CNC mill. Oh wait, I’m pretty sure my DRO angled line function will allow me to do that … bye, I’m off to the shop. 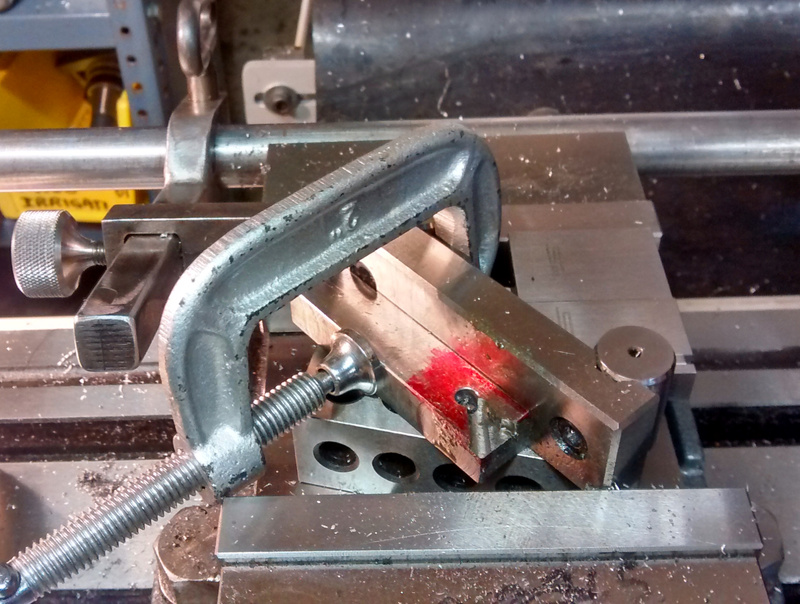 ¹Doh moment – I forgot I have several toolmakers vises, which may have worked quite well, I’ll have to check. You might also be asking why didn’t I just twist the main vise? Because I don’t like to, which is rather stupid given how easy it is to re-tram it. 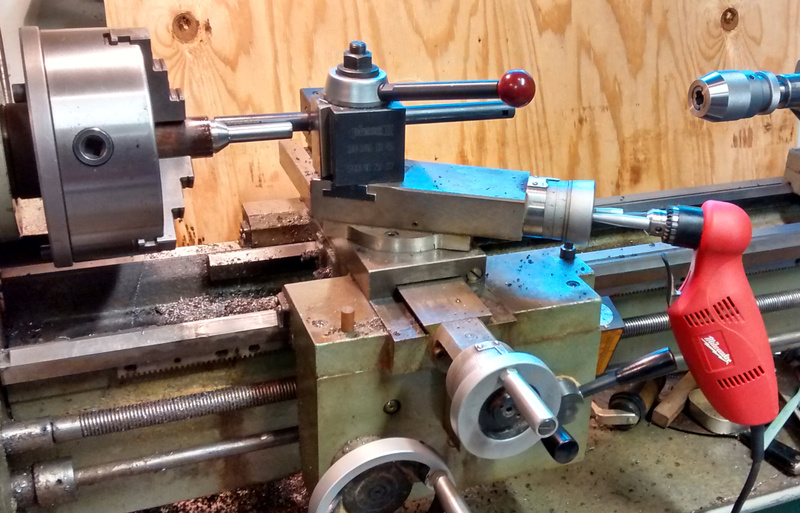 For cutting short tapers on the metal lathe, the compound slide (the one that sits on top of the cross slide) is often used. The problem is, if you (ie me!) can’t turn the knob in a nice slow smooth manner, the finish looks like crap. And my lathe doesn’t have power feed on the compound (and I don’t of any that do). So I rigged one up using a power drill. I think a cordless screw driver would be ideal but I don’t have one. Anyway, there is a 6mm set screw that does something on the knob so I stuck a chunk of hex rod in there, hooked up the drill and voilà, we got power. 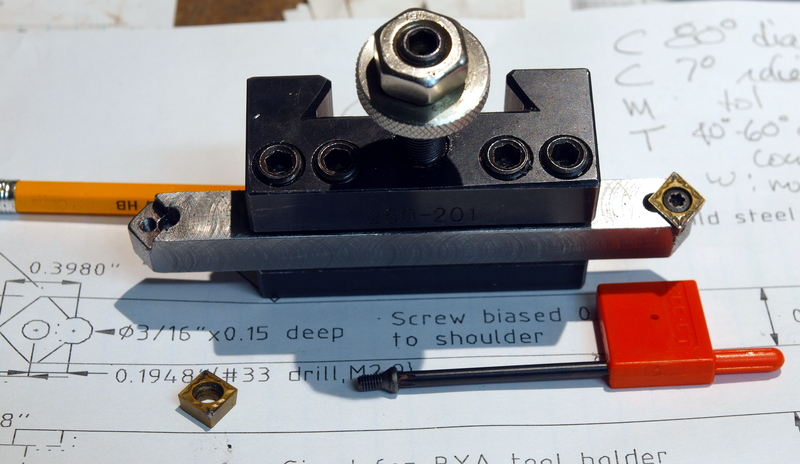 In this case, I’m turning a 60° taper at the end of a tool-to-be (dovetail cutter) so I set the compound to 30°, used a boring bar to get the reach I needed, locked the carriage and ran the lathe in reverse. I like doing this op bassackwards because otherwise, the compound knob would be right next to the spinning chuck and I don’t like pressing my already too thin luck. Once I got the hang of it (the compound seems to have some sticky spots so I had to feed faster or slower depending on where in the travel I was), the finish was quite good (I’m using a cutting tool with a large radius). Yea! 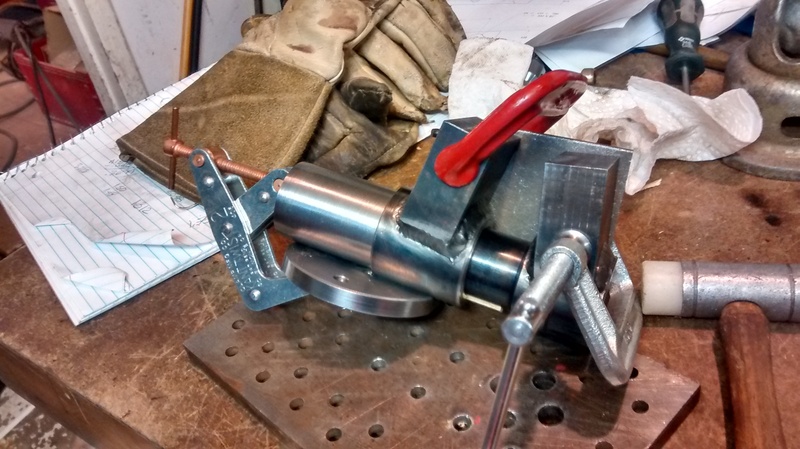 A finished project – The baby bullet welding vise. I’m pretty happy with how this turned out, it works well and everything lines up and functions as it is supposed to. The only thing I don’t particularly like is the shape of the jaws – too bulky and square. But that is cosmetic so no big deal. I made the mandated by law “at least once per project catastrophic screw up” by mentally flipping coordinates and milling off too much on one of the jaws. A catastrophic screw up is one where you would scrap the part if happened early in the project but now there is so much work in the part the screw up needs to be fixed. In this case, braze in a patch and re-machine. It was so much fun, a few days later I got positive and and negative mixed up and blew past the zero point. Right next the first screw up. Sigh. Same fix. It is nice they can’t be seen in the video even though they are in full view (just below where the rear jaw bolts on, across the face and to my left). I am developing a real love/hate relationship with the mill DRO. So much potential, so poorly presented. A big problem I have is I view the coordinate system inverted from what the machine people see; coming from a math/graphics background, I view the work (screen) as fixed and the cutting tool (cursor) as moving (vs work mounted on a table that moves in relation to a fixed tool). I tried reversing the “polarity” of the display but I think that may mess up some of the things the DRO can calculate. The DRO calculator is a real piece of work – no operator precedence at all (for example 1+1/16 is calculated as (1+1)/16, a huge pain when you have to move some fractional distance), I regularly try something that causes it freeze, pressing +/- at certain times causes the right most digit to get overlaid with some other characters, +/- is lame in general, transferring numbers to axis’s is something I just don’t get. I don’t get it – four function calculators has been a solved problem for decades. Retail for 32 bit SoCs (system on a chip) is like $6. The arc functionality is great, at least once I get the data entered; this number is entered with this sequence, the next number requires a different sequence, bah! Funny enough, I can figure that out but the “simplified arc” I can’t. In case you care, this is an Easson ES-8A. I’m pretty happy with how position is updated. I’m just itching to re-write the head software but, having spent a decade or so doing low level firmware, I know that it is a tar baby. Then again, TouchDRO runs on a phone or tablet and looks pretty good. 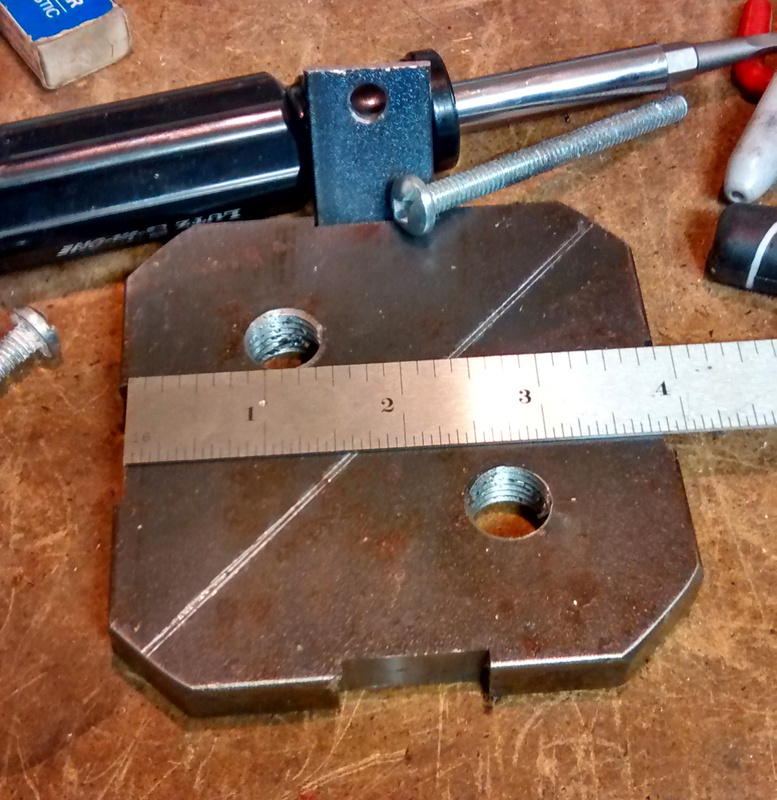 Another wish: Ability to store a handful of position/offsets from the scale zero, for example, one corner of the vise which would give you an edge, no need to indicate. You can store 200 points from “absolute” zero but if you hit “zero Y” the stored points are offsets from the new zero (which is what you want when doing repeat parts). If you think ahead (unlike me), you can always be in Inc mode (basically a separate work space) but since the scales have a physical mark (halfway point) the reader can see, it would be nice to have some offsets from that point, they would be more “sticky”. This is what you get slather some metal with flux and heat it up over 1000°F for a while. Ugly. If you do a good job and don’t burn the flux (the black stuff in the middle of the green), a hot water soak will dissolve the flux. If you did burn it, you’ll need abrasives. 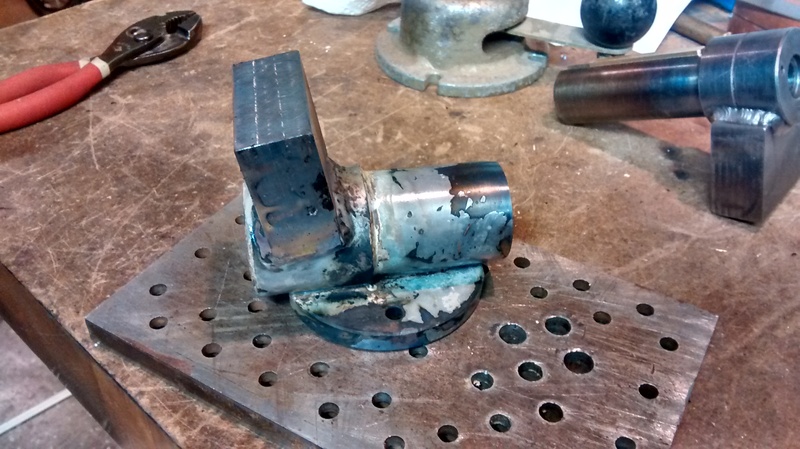 These are the three parts that make up the base of the vise silver brazed together (the jaw block is welded to a tube). I dislike brazing, especially silver brazing (as the flux is really toxic), it’s just too damn slow. But for parts like this, it is pretty ideal – lots of surface area and a sliding joint. Plus, silver brazing is pretty low heat on the join-metal-together scale of things so heat induced warpage is minimal, which is nice as I don’t want the inner most tube to change shape. Jigging for brazing is always an issue as the flux gets slippery when hot and things are moving as they heat up. In this case, I TIG tacked one part and clamped another. 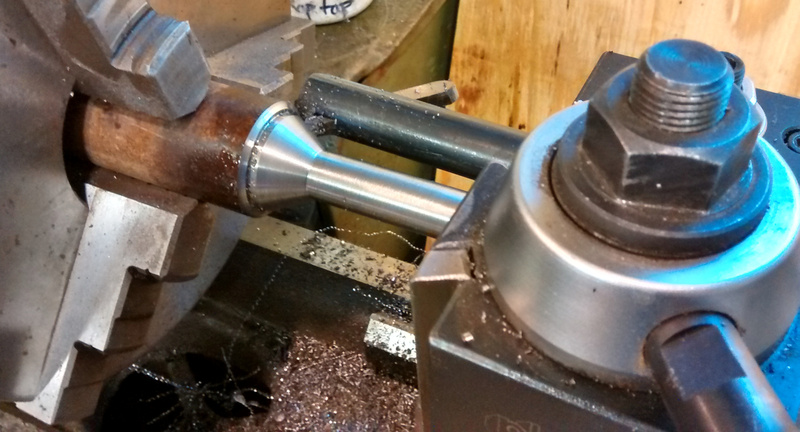 A job for an annular cutter, hole saw or boring bar (or some combo thereof). But I want to play with a DRO feature: cutting an arc (or, CNC the very slow way). Nothing special about this job just a bit different approach. Slow and tedious but I can take bigger bites with an endmill than a boring bar and I don’t have annular cutters and dislike using hole saws. One of those jobs you really don’t want to do but, like a frozen pipe or overflowing toilet, it’s best that it gets done sooner than later. In this case, installing leveling feet on the mill. I knew this mill didn’t come with levelers but since it had threaded holes through base casting, I hoped it had provisions for adding them. I didn’t ask because I didn’t want that to be a reason to get cold feet. But noooo, the machine is meant to be bolted to the floor and leveled with shims (?!?). The base is open. Hmmm, hmmm. I think an ideal base would be square a tubing surround of the base but since I don’t have a crane, I would not be able to install it. So I came up with these shoes, which work fine but were a pain in the arse to fitup and install. 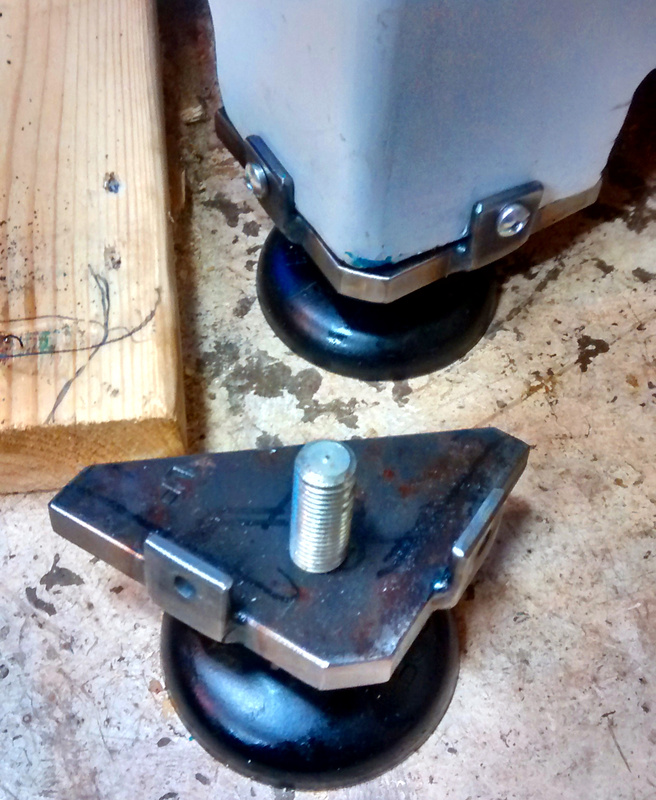 The leveling feet are Bosch units with M16x2 (5/8″) threaded posts on steel pads that I got at the scrap yard decades ago just knowing that would come in useful one day. I put a piece of paper under one corner of the mill and traced around it, cut some 1/2″ steel plate and made what you see above. Stared at it for a while and decided I would screw it to the base (it needs to be attached so they can’t walk away but loosely so if as the mill settles, they don’t crack the cast iron base). So began the no fun dance: jack up one side of the mill, slide in a foot, lower the mill, note which way the tab needs to bend to match base curve, try to stand up, mash head on feed handle, say “ouch” in many different dialects, jack up mill, try remove foot, jack up mill some more, remove foot, mash head, over to the bench, tweak, repeat. That was the easy part. Then mark, drill and tap holes in base. Do it poorly, lying on floor to try and drill level, repeatedly mashing head, back and forth to the bench to file out the tab hole so the screw fits loosely when the foot is weighted. And the front two are installed. OK, they work. For the back two, stream line the process and correct a stupid. The tab is 1.5″ high so there is some meat at the bottom of the tapped hole. The 1/2″ plate worked well. Inset the tabs because it looks better if you can see that the mill is firmly on steel. 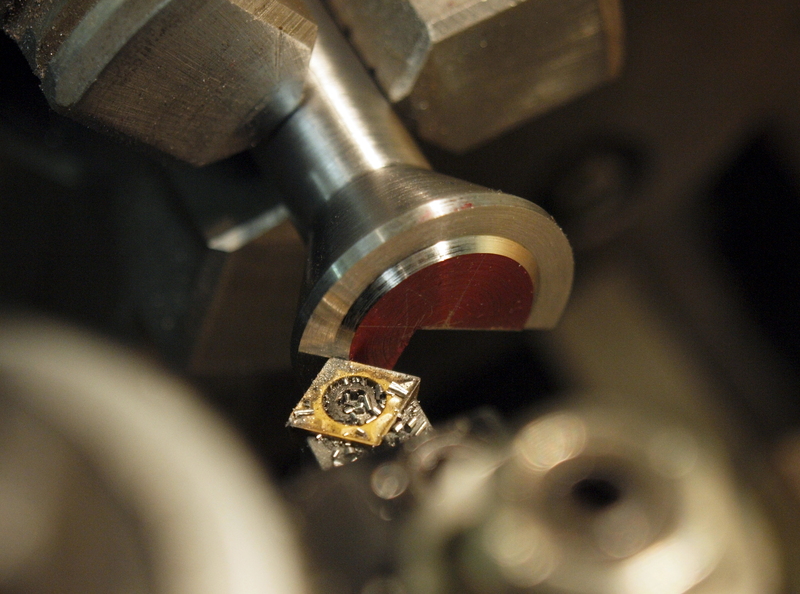 By making the part symmetrical as shown, there is minimal measuring, just rotate, push against the stop, make the cut. For the holes, I played with a feature of the mill: storing points. There are five steps: spot drill, pilot drill twice, drill to size, tap. By storing each location, I could do an op, push a button on the DRO, move to (0,0) and repeat. Do a tool change, repeat. Way nice when a tool change can involve climbing a ladder to loosen the drawbar. Just because it is cool, here is power tapping one of the holes. Sooo much nicer than grunting one these big taps.